Why do I not panic? Added Sabana REIT. In my last blog post and probably a couple more before that, I mentioned that we should stay calm and rational, have a plan and act upon it. This is my personal mantra and it has not changed. 1. I am not investing using borrowed funds or funds which I need in the near future for other purposes. 2. Of my total investible cash, only 50% or so has been deployed in the stock market. In the last few sessions, it could have bumped up by a few % points. 3. I am informed by FA on a counter's value and by TA on a counter's price. I buy when I see value and when prices are at supports. 4. 80% or more of my investments in equities are for passive income and I sleep well with the knowledge that I will have regular cashflow from my investments. 5. I know I will divest partially if prices should rebound to test resistance levels. Yes, I am not one to fall in love with my investments. This list is probably not exhaustive but they are five reasons off the top of my head. Today, the only counter that hit my target buy prices is Sabana REIT at 88c and 87c. At these unit prices, we are looking at distribution yields of slightly more than 10% per annum. My overnight buy orders at these prices were filled. Some ask me if I will be buying more units of Sabana REIT if its unit price were to weaken. 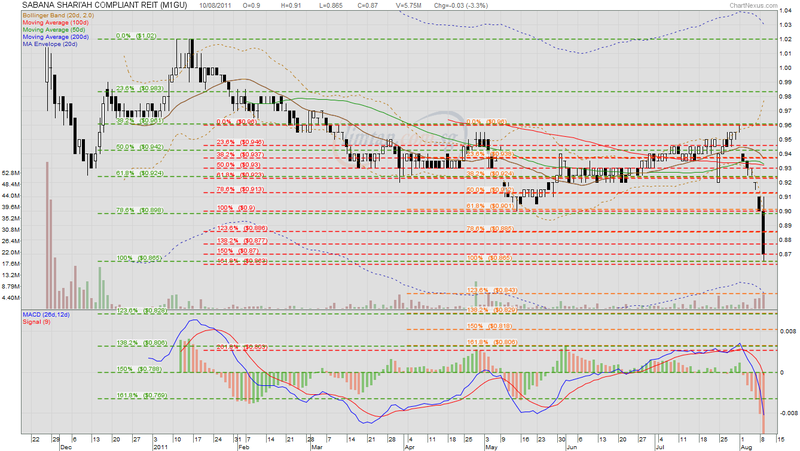 Looking at the chart and using three sets of Fibo lines, I have identified stronger supports at 83c and 80.5c. 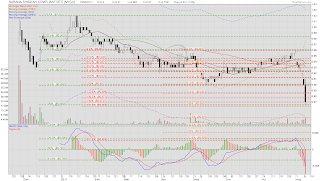 If the immediate support at 86.5c should break, those are the prices where I will be adding to my long position.